Above: Kirsty Money, violin; Cheryl Steadman-Roth; Isabelle Fournier, violin; Jason Roth; Imelda Darwish; Susan Sayle, viola; and Benjamin Marmen, cello. Symphony Nova Scotia musicians and some visionary donors brought beautiful music to Berwick this week. Students at Somerset and Berwick & District Schools enjoyed an eclectic and spirited program of string pieces followed by a musical Q&A. 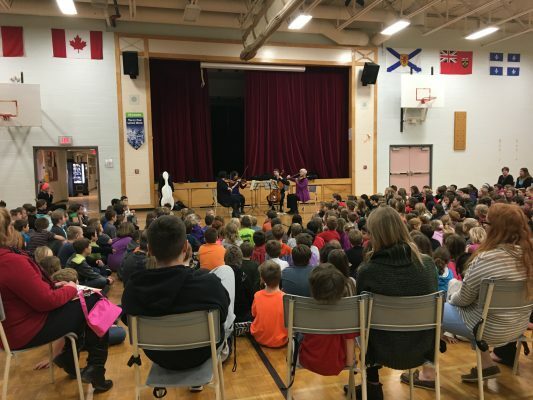 The Quartet concerts were fully funded by the Adel Darwish Diversity Outreach Fund through the Symphony Nova Scotia Foundation. The performances are part of an ongoing project which will enable the orchestra to reach out to rural and underserved communities that might not otherwise have the chance to hear live orchestral music. 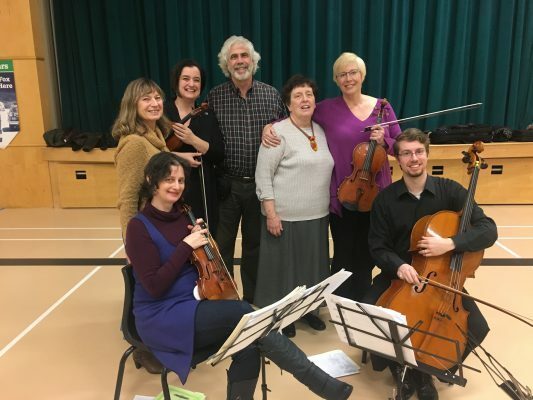 Symphony Nova Scotia would like to express our sincere thanks to Dr. Jason Roth and Cheryl Steadman-Roth for their vision and generosity in initiating this project. It is named in memory of the Late Adel Darwish, a retired psychologist and inspiring mentor to Jason early in his career. His widow, Imelda Darwish, attended the Berwick concerts and opened with a few words about the joy that music has brought to their lives. Jason also knows from personal experience that the sounds of symphonic music can stir the soul, excite, and inspire.